Today, I had one of those so-happy-you-cry moments. I saw my first graphic novel on Amazon. It's always exciting to see a new cover, or to get to announce a new book, although that doesn't usually drive me to tears. This time, though, it's different. Although this will be my 10th-ish published book, depending on how you count, it was actually my first real book. The first one I wrote. The one that got me an agent and then failed to sell. I wrote it in 2007 and signed with Agent Kate in 2008. The manuscript went to acquisitions over 10 times, I think. It kept coming so close and then falling apart at the last minute. Eventually, we shelved it in favor of what would become Bad Taste in Boys. That sold quickly, and of course I was glad, but I never forgot that first manuscript. I'd started writing it during my maternity leave with my twins, after midnight feedings while I was waiting for them to go back to sleep. I loved that book for a billion reasons. Because it was funny when I needed to laugh. Because it was about strong girls, and I'd just had two of them. Because it was the first manuscript I wrote that made me think maybe I could really do this writing thing. In my free time, I started turning it into a graphic novel script just for fun, and because I couldn't keep from messing with that story. I mentioned it to Agent Kate in a self-deprecating, isn't-this-a-funny-thing kind of way. She turned around and sold it, to my surprise and delight. It will hit the shelves in June. 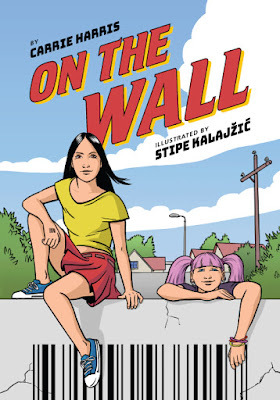 I describe the book as GHOST WORLD meets superheroes, which I personally think is awesome except that I'm biased so it probably doesn't count. I have had the good fortune to make a few of these announcements, but this one takes the proverbial cake. I'm so thrilled and lucky and grateful to be able to share this story with you. It has baby pools and accidental forkings and girl power and peeping toms and government agents and scary teachers modeled after my old high school English teacher, who was the first person to tell me that I should be a writer. I thought the best thing I could do to thank her was put a character inspired by her in a book, so I did. She WAS pretty scary. It comes out in June, and it's available for pre-order, if you happen to like that kind of thing. I'll post more order links as they come out, too. It's called ON THE WALL, and I really hope you like it. Illegal Alien is out today! This alien and I are both getting jiggy with it. We're excited because it's the Illegal Alien release day! This book is a whole lot of new for me. It's my first adult book. It's my first foray into self-publishing. It's the first book for which I got to make up a lot of ridiculous swear words. It makes me happy. And also nervous, because I really like this thing, and I would like to do more of this thing, so I hope other people like this thing too. In fact, I hope YOU like this thing. If you read the book and decide that you do in fact like this thing, and you would like more things like this thing, there is something you can do which costs NO MONEY and relatively little effort. REVIEW. Give it however many stars you like. Write a sentence or more than a sentence. "I like this thing and think you might like this thing too" does in fact count as a review. It might seem like a tiny thing, but it really helps. As soon as a book reaches 20 reviews, all kinds of promotional opportunities are unlocked--but not before then. And further reviews help bump it up in search results and "You Might Also Like This Thing" web recommendations, and so on. I know it sometimes seems like posting that review is a waste of time, but it really isn't, especially for self-published books. It might make the difference between that series continuing or ending prematurely before you find out that Lord Kartafflesalat is really a sentient potato monster, which would be TRAGIC. But seriously. I've got three books currently planned in the series, but I'd love to write more. If you'd like to see it happen, you can urge it along by reviewing! The Createspace book and the Amazon book are exactly the same, but I sure wouldn't blame Prime members for wanting to wait and get that free shipping. And if the book isn't in your budget right now, I'll be doing some sales and some review giveaways as soon as my copies arrive. So stay tuned here or follow me on twitter to stay on top of that. Aaaand now I'm going to go dance around my house like that alien. You think I'm kidding, but I'm totally not. Lots of excitement here at Chez Harris, so let's get right to it! If you're interested, you can check out the pilot episode for free and see what you think. You can also visit the ReMade page and subscribe for the season (and save some cashola and trouble) or buy individual episodes at your leisure. Episodes come out every Wednesday, and the series is a nail-biter. I knew what was going to happen, and I was still on the edge of my seat when I read the episodes written by the other members of the writing team. My first episode is #3, but you're not going to want to miss any of them! I wrote a grown up book! With grown ups in it. And aliens, because hey, it's me. I started out writing this book for fun but ended up having so much fun with it that I couldn't stop, and now it's a series. It's about a snarky, middle-aged police detective named Audrey Vorkink--and yeah, I might have inflicted my sense of humor on her. I write a lot faster than the publishing industry moves, so I'm trying out a new thing and self-publishing this series. ILLEGAL ALIEN comes out on October 18th, with the sequel, UNIDENTIFIED FLYING SUSPECT, following in January. Toledo police detective Audrey Vorkink has a rep for getting things done. She might look like a middle-aged soccer mom (complete with mom bob), but she works hard and unwinds even harder. One night, as she’s meeting with her edgier-than-it-sounds knitting group, a hit-and-run accident turns deadly right outside the building. But something’s fishy about the missing driver, something positively…inhuman. 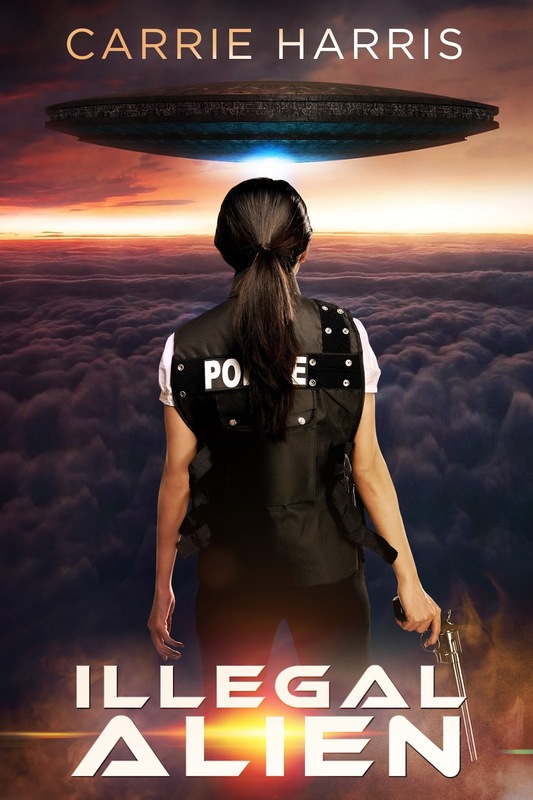 Audrey can run down any criminal, but what if this one’s from another planet? Detective stories meet extraterrestrials (maybe) in this laugh-out-loud novel by Carrie Harris, author of BAD TASTE IN BOYS and DEMON DERBY. You can preorder an ebook copy here! I also intend to offer physical books as we get closer to the release date. If you're interested in reviewing the book, leave me a comment below or email me at carrie@carrieharrisbooks.com! Aaaaand look at this gorgeous cover, designed by the brill Steven Novak. Please note that this book is written for adults. It has bad words in it. I made some of them up. That was fun. SALLY SLICK AND THE MINIATURE MENACE RELEASE DATE! Sally’s frustrated when she’s shut out of the county fair tractor race, but that’s nothing compared to how she feels when the tractor itself goes missing. When she and her stalwart friend Jet Black track it to the grounds of the Circus Europa, they get more than they bargained for. Sally can handle nefarious cultists, mysterious fortune tellers, elephants on the rampage, and high flying aeroplanes, but a chance encounter with a miniaturized menace will change everything she knows about the world. And it comes with another great cover, this one courtesy of Dani Kaulakis! Young Centurions has a cover! Look at the pretty!!! Speaking of pretty, I also have a new website. I lurved the old one with a lurvely lurve, but I’m starting to branch out beyond teen comedy, so it was time to revise. So it’s double pretty! An explosion of pretty! Like firing a cannon full of supermodels. Only…well…not. Anyway. We’re in the final days of the Fate MoreKickstarter, which gives you an opportunity to order Young Centurions--along with a bunch of other cool games--now and have it automatically shipped to you when it becomes available. Because sometimes being lazy is okay and even encouraged. But if you’re not into the Kickstarter thing, don’t worry. YC will be available for purchase later, and I’ll make sure to update the pretty new supermodel cannon website with the ordering info when it becomes available. With the Young Centurions game coming out soon-ish, I’ve been talking a bit about some of the cool things you can do with tabletop roleplaying games and kids. I think a lot of parents and teachers would use them more if they only knew how many things you can do with them! I’ve already talked about teaching cause and effect and teaching them the value of failure, and today I’d like to briefly talk about how you can use RPGs to teach kids to solve problems on their own. I’m going to be honest; as a parent, this is something I struggle with. I want to support my kids. I want them to know they have my help with homework, that I’ve got their back with problems, that they’re not alone in dealing with whatever they’re dealing with. But it’s so hard to keep that in balance, because they also need to learn that they’re capable. Smart. That they don’t quite need me as much as they once did. It’s sad-making but necessary. The biggest problem that I run into is that they’re used to having constant help and support. They’re used to being able to ask us for the definition of an unfamiliar word or, at the most, look it up on their tablets instead of taking the time to figure it out on their own, which is ironic because sometimes the process of finding the answer online takes longer than it would have taken to just THINK ABOUT IT. And their default is to call for help. They will sit in the chair next to the clock and ask me what time it is. They'll ask me where to look for their lost soccer socks instead of looking in all the places they looked last time. Please don’t let me imply that they’re lazy; I honestly think this is a habit more than it is a willful desire not to figure things out on their own. It just hasn’t clicked that they’re capable of answering all those questions on their own, and my repeated suggestions to look at the clock or stop and think about what they did last time aren’t getting it done. I needed (and still need) to do more. Here’s where RPGs come in. In a storytelling game like Young Centurions, the players are faced with a series of problems. For example, Eugene Falks is picking on the smaller kids again, and you’re watching from your hideout. He doesn’t know you’re there. Do you stay safe and let him beat up on those kids, or do you help them? Is there a way that you can help them without putting yourself in danger? Maybe you could trick him, but how? In today’s world, they’d get an adult, right? But this is a no-risk way to explore problem solving on their own. I find that this approach works best in scenes with kids only, if you can manufacture that scenario. For example, if my husband was playing a character in this scene, the kids would all defer to his decision-making, and for teaching purposes, that’s what I don’t want. So I might use this scenario in a session where he can’t make it, or have him break off with one of the kids and play out a conversation while I run the scene with Eugene Falks with everyone else. And then, no matter how hard it is, I have to resist the urge to make suggestions. Encourage them to think it through. And, if necessary, allow them to fail. Again, remember that we try to make failure interesting in RPGs. Perhaps they take the time to think it through and manage to successfully trick Eugene and get away safely. But maybe their hasty decision making results in them getting pounded. What do you do then? You could shame them by pointing out that they didn’t use their brains and look at the result. Or you could follow that up with another opportunity to do it right. Perhaps their characters are sitting there nursing bloody noses when the original victim sneaks back to thank them for trying. Maybe he got away while Eugene was chasing the characters, and now he wants to reward them with some information about Old Man Jenkins. But the dump, where Old Man Jenkins lives, is extra dangerous. Even more dangerous than Eugene was. So now they’ll have to learn from their mistakes and try it again…after their noses stop bleeding. And of course, as soon as they do manage to do it right, it’s important to reinforce that. Make sure they realize that they’ve solved this complicated problem all on their own. Talk through the early mistakes they made and how they learned to do better. And encourage them to look at the clock or figure out that definition on their own next time. I like writing books, playing games, fighting evil, and cooking (everyone's got to have hobbies).